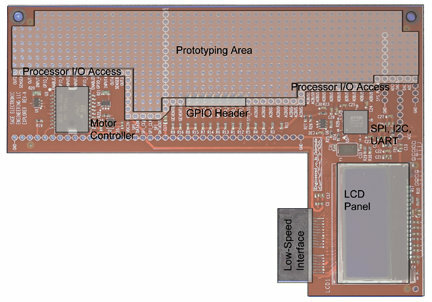 The Gizmo Board – A compact (10×10 cm) development board for powered by an AMD G-Series APU. The Explorer Board – An expansion I/O board providing an alpha-numeric keypad, a micro-display, and a breadboard area for prototyping and customization. Sage SmartProbe JTAG Development Tool – The kit includes the SmartProbe hardware and 20 hours of trial time use. Ethernet & USB Cables – The USB cable lets you connect the SmartProbe to your PC. The Ethernet cable is for networking connectivity, which can be used to access the SmartProbe as well. Power Supplyand Cable – A universal power supply for the Gizmo board, with a U.S.-standard cord. Installation DVD – Includes a trial version of the Sage EDK, a graphical interface for development and debugging, and the Gizmo Explorer Kit user guide. AMD G-Series APU: G-T40E Dual Core @ 1.0 GHz with Radeon HD6250 GPU. Up to 52.8 GFLOP capacity, 6.4W TDP. 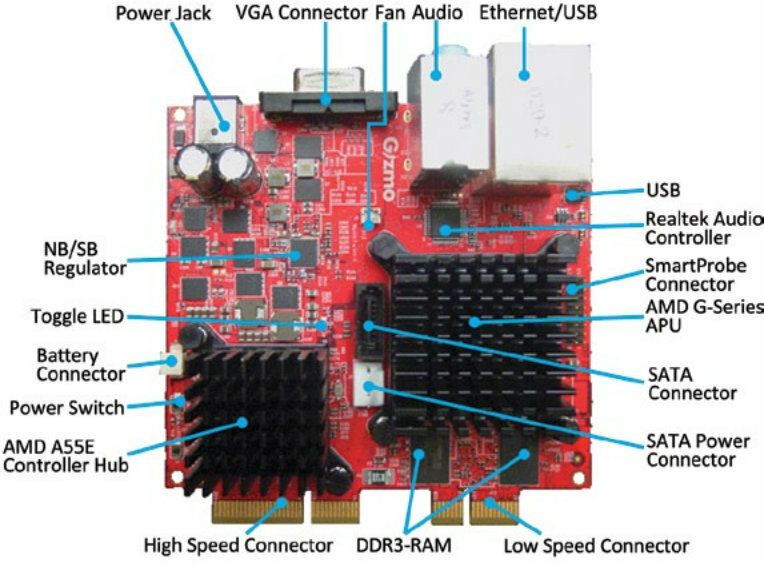 The Gizmo Board comes pre-loaded with SageBIoS, a distribution of open-source Coreboot project. The source and build files for SageBIoS are included with the DVD, and can be accessed and modified using Sage EDK. The board supports multiple operating systems such as Windows, Linux and some RTOS. The project is apparently still under development (pre-release phase) and documentation is limited. But the Gizmo Explorer Kit being an open source hardware, the people behind the project will eventually release the schematics, provide downloads (source and binaries) and proper documentation. If you want to ask questions or follow the progress of this project, the best is probably to join their Google Group, Forums or IRC channel #gizmosphere & #gizmo on Freenode. The Gizmo Explorer Kit is currently available for pre-order for $199, and will be available in 2013. You can find further information on Gizmosphere.org.